This says "Brixton Market 1975" but the Delroy Wilson LP on display didn't come out until 1977. I also don't remember anywhere in Brixton Market looking like that. 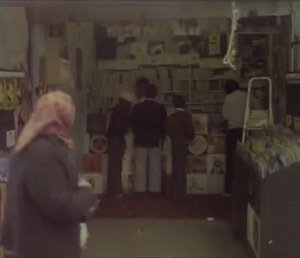 So.....it may well be Sound 7, which I think was in London Fields' market but it does look very similar to Webster's in Shepherd's Bush Market. The answer is Broadway Market, London Fields .